The other day, something momentous occurred. I reduced my to-be-read pile to fewer than 50 books. Sound the trumpets! Now, this just means physical books that I own or that I have stored on my Kindle. 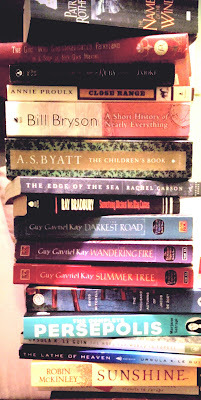 If one were to actually list ALL the books that I would like to read...well, let's not talk about that. Once I get my backlog down, I can buy more books. WIN. This also means I'm one step closer to winning a bet. I've mentioned before that my husband and I have a friendly wager going. A few years ago, we made a bet about which of us would reduce our respective backlogs to a certain point first. For him, video games. For me, books. We agreed that 10 percent of the current list was fair. At the time, I had about 120 books on the shelf, so I need to get it down to 12 or fewer. (I'm totally winning, by the way.) The winner gets to name the prize. I can't decide if I'm going to blow this on something all at once, like a weekend getaway, or string it out for a while by getting out of household tasks. Because I'm going to win. Beyond being a bit of a running joke, our bet really has really helped me reduce Mt. TBR. Whenever I'm tempted to buy a new book, I remember that I MUST WIN. That helps, sometimes. Make a bet. Maybe it's the runner in me, but nothing adds excitement like a little friendly competition, even if nothing is riding on the outcome. Find a spouse, friend, or roommate with a similar backlog--books, video games, recipes, knitting projects, etc.--and agree on terms that will be fair. If you're both reading books, and one of you reads 800-page epic fantasy novels and the other likes short romance novels, or if one of you is a slower reader and the other really fast, you might have to be a little more creative in how you set up the wager. Be honest! Join an online reading challenge, like this one. Goodreads is a perfect source for these. There are thousands of groups to join, focused on every possible subject, basically like an online book club. There are also many different kinds of challenges--like read a book that takes place in each of the United States, or on every continent--the possibilities are endless. Obviously you have to be careful that these sorts of challenges help you subtract, not add. The challenge I joined is for any book as long as it was on my shelf at the beginning of the year. Perfect. Set a reading goal. This is just a number of books you hope to read in the course of the year. Since it's August, you could start with a monthly goal. Goodreads has a cool widget (see mine on the sidebar) that shows your progress throughout the year, and you can set it up any time. It's fun to finish a book and see your percentage creep higher. It also tells you how many books behind you are. Thanks, Goodreads. Give yourself a break now and then. Just accept that sometimes a book is released that simply can't wait. Or someone lends you a book that you don't want to keep too long. Slot these in to keep things interesting, but don't lose sight of your list. Abandon it. Life is too short to read books you don't care about. Go through your shelf every now and then and cull any books that you realize you just aren't excited about reading anymore. Also, if you start a book and it's not doing it for you, there's nothing wrong with giving up on it. You can give these abandoned books away or trade them in for credits on Paperback Swap. It might not be for you, but someone else will love it. Who else has a big Mt. TBR? I know that 50 books is nothing compared to some.